Classic Opalescent windows are more intricate than our Simple Opalescent windows The pieces of glass are smaller, adding to the labor to cut and assemble. 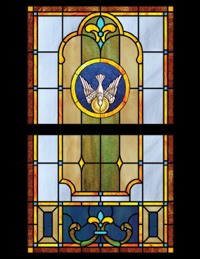 Defined by their recurring opalescent background designs that showcase various painted medallions, these cost-effective windows offer both continuity and customization. Each window features a different selection of scene or symbol. 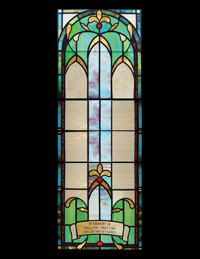 Thematic scenes can be selected from our New Testament “Life of Christ” series or from our collection of Old and New Testament symbols.Windows also feature a special area for optional memorial inscriptions. Opalescent glass is characterized by streaks of color and a milky, iridescent appearance. 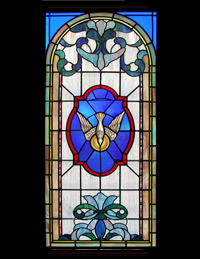 While it is more opaque than typical translucent stained glass, the two are commonly used in conjunction with one another. Additionally, opalescent glass aids in controlling the amount of sunlight that passes through windows. In turn, this decreases sun glare and helps to keep room temperatures stable.